9. Division of Pulmonary and Critical Care Medicine, Johns Hopkins University, Baltimore, U.S.A. Inhaled therapy for lung cancer is a local form of treatment. Currently inhaled non-specific cytotoxic agents have been evaluated as a future treatment for local disease control and distant metastasis control. There are few information regarding the influence of local transporters and gene expression of the respiratory epithelium to the absorption of administered drugs. In the current work we used adenoviral-type 5(dE1/E3) (Cytomegalovirus promoter) with human ABCA10 transgene (Ad-h-ABCA10) purchased from Vector Labs® in order to investigate whether gene therapy can be used as a pre-treatment to enhance the efficiency of inhaled cisplatin. We included the following groups to our work: a) control, b) aerosol vector, c) aerosol vector plus cisplatin, d) aerosol cisplatin, e) intratumoral cisplatin administration, f) intratumoral vector plus cisplatin administration. The results indicate that the aerosol cisplatin group had a long term survival with the intratumoral cisplatin group following. 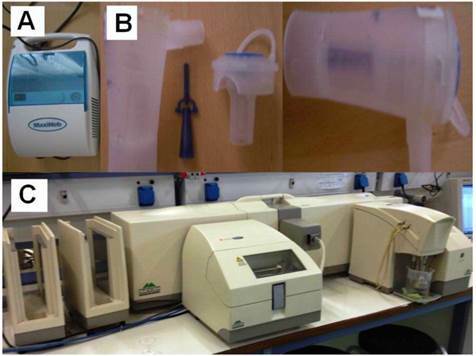 The enhancement of the ABCA family locally to the respiratory system prior to the aerosol cisplatin administration can be used safely and efficiently. Future treatment design of local therapies should include the investigation of local transporters and genes. Keywords: ATP, ABC10, lung cancer, gene therapy, chemotherapy, aerosol. Lung cancer treatment is an evolving field of science, currently there are several pathways under investigation as a possible treatment target.1-3 Targeted treatment is currently considered to be more efficient compared to the non-specific cytotoxic drugs, however; the small number of patients identified with mutations, limit the application of these drugs. It has to be stated that both targeted and non-specific cytotoxic agents have adverse effects, and in many cases treatment has to be postponed.4, 5 The main issue that is under investigation in both treatment modalities is how to achieve higher drug concentration in the cancer tissue and protect the normal tissue. Therefore the concept of administering treatment directly to the target tissue has been pursued in lung cancer with many forms such as; intratumoral6, 7, aerosol8-10 and intracavitary11. Gene therapy and suicide gene therapy have been pursued in lung cancer, each method has its advantages and disadvantages.11-13 Gene therapy needs vehicles for the transfection of the genetic material mainly the viral and non-viral. Viral vectors have the main adverse effect of inducing neutralizing antibodies, while several non-viral vectors present toxic effects (e.g. respiratory system).14, 15 In an effort to deliver efficiently the necessary drug concentration to the tumor site and prevent systemic adverse effects, the concept of administering local treatment for lung cancer has been explored. Aerosol chemotherapy with cisplatin9, carboplatin8, gemcitabine16, 17, paclitaxel18, doxorubicin19, 20, 5-Fluoracil21 and bevasizumab22 administration has been investigated for safety and efficacy. One of the major parameters was the safety of these agents in the respiratory airways and lung parenchyma, since several of these agents are known to cause adverse effects.23 The main adverse effects observed were cough, transient fever and transient decrease in the respiratory functions after the aerosol administration.8, 19, 20 Moreover; it has been observed that excessive deposition of these agents in one site of the respiratory system can induce non-specific side effects in the form of pulmonary edema as observed with many other drugs.16 These side effects were milder when a premedication with bronchodilators and inhaled corticosteroids were administered.8, 19, 20 Until now no long term trial (>9months) has been performed since all patients included in previous studies had stage IV non-small cell lung cancer (NSCLC). Early lung damage detection was investigated for cyclophosphamide with Tc99.24 Several aerosol production systems have been investigated in an effort to identify the ``ideal`` combination of aerosol generator (jet-nebulizer, ultrasound nebulizer), residual cup design and residual cup loading for several chemotherapeutic agents.14, 25 It has been also observed that the aerosol chemotherapy agents are transported from the alveoli to the system and lymphatic circulation.8, 9 Efficient drug absorption is depended on two major mechanisms the passive and the active transportation. The first relies on the biochemical properties of a drug, while the second uses the antigen/antibody connection.26 The use of biotynilated-epidermal growth factor (EGFR) has been used to enhance the accumulation of cisplatin.27 Other local factors in the respiratory system influencing the absorption are the local transporters and genes. It has been previously presented that these factors are differently expressed in different parts of the respiratory system.10, 28, 29 In the current work we will use adenoviral-type 5(dE1/E3) (Cytomegalovirus promoter) with human ABC10 transgene (Ad-h-ABCA10) purchased from Vector Labs® in order to investigate whether gene therapy can be used as a pre-treatment to enhance the efficiency of inhaled cisplatin. The ATP-binding cassette (ABC) transporters are multidomain integral membrane proteins. The ABC transporters are involved in the resistant machanisms of cancers, metabolism, toxicity of drugs and pathogenic microbes to drugs. The structure of these transporters is essential to the rational design of agents which control their function.30-32 In our current work we investigated the chemotherapy agent cisplatin since it the most used chemotherapy drug for a number of cancer types and the application would have an impact on several cancers. One hundred twenty BALBC mice age 7-8 weeks old were purchased from the experimental laboratory of ``Theiageneio`` Anticancer Hospital, and were divided in six groups. The Institute has the following authorization for production and experimentation of mice EL 25 BIO 011 and EL 25 BIO 013. The mice included were isolated (1 per cage) in a temperature-controlled room on 12-hour light-dark cycle and were allowed free access to food and water. The Lewis lung carcinoma cell line was obtained by ATCC (CRL-1642™). The cells were routinely cultured in 25-cm2 tissue culture flasks containing RPMI (ATCC, 30-2002) supplemented with 10% fetal bovine serum (Biochrom) according to the supplier's instruction. The cell line was incubated at 37ο C in 5% CO2. The doubling time of the cell line was 21 hours.33 At confluence, cells were harvested with 0.25% trypsin and then were re-suspended at 1,5×106 cells in 0.15 ml PBS (Phosphate Buffered Saline, Dulbecco, Biochrom) which was injected in mice. The back was inoculated subcutaneously (27-guage needle, 1,5×106 cells). The tumor volume was measured once weekly using bidimensional diameters (caliper) with the equation V=1/2ab2, where the a represents the length and b the width (mm3). The tumor was grown on the back of the mice. The animals were randomly divided into six groups of 20, when the tumor volume reached ~100mm3. The mice were divided into six groups as follows: a) control group (no therapy), b) only gene therapy inhalation, c) aerosol gene therapy plus aerosol cisplatin, d) aerosol cisplatin, e) intratumoral cispaltin and f) intratumoral cisplatin plus vector. The chemotherapy drug was obtained from our Lung Cancer Oncology Unit; i) Cisplatin/Hospira® 100mg/ml ONCO-TAINTM. Aerosol administration was performed as follows, the residual cup was filled with 8mls of the cisplatin agent and the nebulisation time was 10 minutes (almost 1 ml/minute) as observed from our previous studies.14 The aerosol was delivered to the mice (one by one) within a nose only cage that has been previously presented.34 In the groups receiving the intratumoral cisplatin an insulin injection was used to deliver the 2mls of cisplatin within the tumor in different depths, however; a quantity of the drug when the injection was made superficially was lost since it was not accumulated. The drug was injected in no more than three sites since we did not want to cause extensive damage to the tissue covering the injection site and cause inflammation. Previous published data with aerosol cisplatin indicated that the Maxineb® (6 liters/minute and 35 psi) with a large residual cup (≤10mls) produced 1.266 μm.14 (Figure 2). In the current work we will use adenoviral-type 5(dE1/E3) (Cytomegalovirus promoter) with human ABCA10 transgene (Ad-h-ABCA10) purchased from Vector Labs® PA, USA (Titer 5.0 x 1012 VP/ml, 1.1 x 1011 IFU/ml, Gen Bank RefSeq: NM_080282) in order to investigate whether gene therapy can be used as a pre-treatment to enhance the efficiency of inhaled cisplatin. (sup 1) The material was stored in -80oC with a viral solution component: PBS with 5% Glycerol and had 2 x CsCL purification (Lot#: 20130906). The procedure to measure platinum in the biological tissues includes a sample pretreatment step to extract platinum from the sample matrix followed by the determination step using a technique of atomic spectrometry. In the first step, the sample mass to be digested can be up to ca. 1.000 g however in some of the samples lower mass (e.g. 0.1500 g) was available and was finally digested. The procedure involved weighing of the samples in Teflon® (DuPont, DE, USA) crucibles, addition of 6 mL concentrated HNO3, and heating in a steel autoclave (Berghof, BTR 941, Eningen, Germany, six-position aluminum block). High pressure conditions in the closed vessels assist the decomposition of the sample tissues which is completed in less than 2 h at 130 0C. The obtained solution was diluted to 25 mL by double de-ionized water. All animals were killed on the 20th day after the initiation of the administration. The mean volume values were recorded throughout the experiment and upon death or the last day of death the final measurement was included in our data for mean tumor volume measurement extraction. The mean volume measurements are as follow for each group (mm3): a) 2234.2, b) 2156.2, c) 351.25, d) 450.75, e) 489.25 and f) 364.5. Seven mice from group a, six from group b, one from group c, two from group d, one from group e and one from group f died before the 20th day of the experiment. We additionally used mice in order to acquire the necessary tissue samples in order to evaluate the cisplatin concentrations within the tissue. The results in Table 1. indicate that there was high concentration of the cisplatin within the tumor with the intratumoral method of administration when compared with the two aerosol methods at the same time. Moreover; no damage to the lung parenchyma was observed from the aerosol viral vector administration or aerosol cisplatin administration. (Figure 1.) Furthermore, with both methods of administration the cisplatin was diffused throughout the body of the mice. 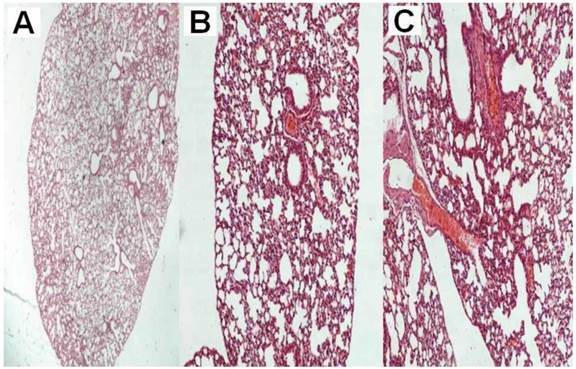 A) normal lung parenchyma after six administrations of the vector x 20, B) normal lung parenchyma after six administrations of the vector plus cisplatin x 200, C) normal lung parenchyma after six administrations of cisplatin x 200. A) Maxineb Nebuliser, B) residual cup with filling capacity of 10mls, C) mastersizer 2000. The respiratory system has defense mechanisms which protect the epithelium against bacterial infection and foreign particles/molecules from being deposited.29 These mechanisms can be summarized to the following: a) beating cilia, b) mucus, c) macrophages, d) transporters and e) enzymes. An underlying respiratory disease such as; asthma, chronic obstructive pulmonary disease (COPD) and cystic fibrosis modifies these mechanisms by reducing the function of beating cilia and increasing the production of mucus. Thick mucus does not allow the administered drug to be deposited properly and a disease exacerbation causes broncho-constriction further reducing the area of drug deposition. Therefore the dosage of administration has to change at it has been previously observed with other treatment modalities such as; inhaled insulin.35, 37 A major obstacle regarding the distribution of aerosol within the airways is atelectasis, tumor mass or pleural effusion. Therefore several trials previous published have as an exclusion criterion atelectasis, pleural effusion and tumor mass more than 5 cm of diameter.8 The rest of the criteria remain the same as in the case of intravenous infusion, renal function, blood values and performance status have to be appropriate according to the NCCN guidelines.38 Moreover; the administered drug has to be safe in order to be provided as aerosol, several chemotherapy agents have been reported to be toxic for the lung parenchyma. 39, 40 Previous studies have been performed with other chemotherapy agents such as: carboplatin, gemcitabine, doxorubicin, paclitaxel, 5-fluoracil, camptothecin, bevacizumab and docetaxel10. However; a large concentration locally to a site can cause a non-specific adverse reaction which is due to the concentration and not due to the formulation of the drug. Therefore aerosol administration should be preferred instead of instillation.41 Furthermore, before drug administration thorough investigation of the method of diffusion locally to the target tissue should be discussed. The Tc99 has been used for lung injury detection42. There have been no serious adverse effects reported with inhaled platinum analogs 43, however; serious adverse effects were observed with inhaled doxorubicin.20 There are two methods of transportation the passive, which relies on the physical properties of the molecules and the active which is based on antibody-antigen connection. The appropriate method should base on the target tissue (transporters/enzymes/genes) and cost-effect, since the active method is considered more expensive.26 The ATP binding cassette (ABC) transporters are a special family of membrane proteins which modulate the absorption. Three major groups are responsible for multidrug resistance in cancer drugs: a) P-glycoprotein (MDR1, ABCB1), b) ABCG2 and c) multidrug resistance associated proteins (MRPs, in the ABCC subfamily). The functionally active ABC proteins consist of four domains, two transmembrane domains (TMDs) and two nucleotide-binding domains (NBDs). These domains could be present within one polypeptide chain or within two separate proteins. ABC proteins utilize energy derived from ATP hydrolysis in order to perform transmembrane movement or regulate specific membrane channel or regulate the permeability of multiprotein complexes. The ABCA subfamily is divided into to two subgroups, the first comprises of a) ABCA5-6 and b) ABCA8-10), the genes encoding these transporters can be found on chromosome 17q24. The second comprises of: ABCA1-4, A7 and A12-13 and are encoded in different chromosomes. The ABCA10 is clustered among four other ABC1 family members on chromosome 17q24, but neither the substarte, nor the function of this gene us well known. The expression of ABCA10 is suppressed by cholesterol import into macrophages, indicating that it is a cholesterol-responsive gene. Weak expression of ABCA10 has been detected in different type of cancer tissue.44 In the study by Takenaka S. et. al. 45it was observed that the ABCA 10 subfamily was highly expressed in skin tissue.45 The expression pattern of chromosome 17 genes has been found to be ressticted with ABCA5 and ABCA10 expressed in skeletal muscle.46 In the study by Liu Y. et. al. 47, the expression profiling of ABC transporters in a drug-resistant breast cancer cell line was investigated using AmpArray. The expression of ABCA10 was partially reversed in the revertant cell line (MCF7/AdVp3000) as observed with RT-PCR. The ABCA10 has been also found to be associated with macrophage lipid homeostasis.48 In our study we also investigated with pathology findings whether either the aerosol cisplatin or the aerosol vector induced damage to the lungs. The viral vector and aerosol cisplatin was safe as aerosol administration to the lung parenchyma as observed in Figure 1. Major limitation of our study was that we did not investigate the macrophage population from the respiratory tract of the mice with broncho alveolar lavage as we are certain that valuable information regarding our pre-treatment and treatment method would have been acquired. Firstly, investigating the toxicity of the inhaled cisplatin and secondly by evaluating the gene expression of ABCA10 gene. Additionally, we did not evaluate the formation of neutralizing antibodies against our gene therapy. These are parameters that we will evaluate in a future project in a larger animal model, since small animals are difficult to handle and in several occasions tend to die within the process from stress. Prevention of multidrug resistance (MDR) should be a future target, possibly with inhaled gene therapy for lung cancer. We should aim at designing agents modifying the function of MDR proteins competitively or non-competitively. These agents will possibly increase the cytotoxic action of MDR-related drugs by preventing the extrusion of anticancer drugs from the target cells. Such a local therapy would have the advantage of being delivered to the target tissue, but also staying within the target cells. However; distant metastasis control is another issue that has to be investigated. Possibly in the future we will have vehicles that will transport drugs throughout the body to the target tissue only from the site of administration with a form of active transportation. The distribution of the drug concentration differed between the aerosol and intratumoral administration. In specific, in the intratumoral groups the cisplatin concentration was high immediately after administration, while in the aerosol cisplatin groups the concentration was significantly lower. However; we should emphasize that in the intratumoral groups the mice were killed five minutes after administration, while in the aerosol cisplatin groups fifteen minutes since the initiation of the administration. The aerosol administration was time consuming needing in total ten minutes for nebulisation of 2mls of cisplatin. Therefore it is clear that the pharmacokinetics of the two methods is different. Furthermore, the drug itself is distributed differently within the extracellular matrix of the tumor and the lung parenchyma, where several and different parameters influence the pharmacokinetics. Indifferent of any administration modality the concentration of the cisplatin was higher with the help of the vector expressing the ABCA10 protein and both modalities achieved the desired concentrations within every tissue of the body. Inhaled gene pre-treatment could be used as an arrow in the quiver for delivering efficiently a therapy. Regarding our study a safety issue was not observed, however; further investigation is needed for other gene transfection administrations. Inhaled gene therapy for lung cancer could be a future treatment if tested properly. Local drug administration is efficient, since drug concentrations diffuse from the site of administration systematically. Dr. Wolfgang Hohenforst-schmidt would like to thank the veterinarian Kyriaki Papadimitriou for her assistance throughout the experiments. Corresponding author: Paul Zarogoulidis, M.D, Ph.D. Pulmonary Department-Oncology Unit, ``G. Papanikolaou`` General Hospital, Aristotle University of Thessaloniki, Thessaloniki, Greece. Tel: 00302310340370 Fax: 00302310992424 E-mail: pzarogcom.